My family enjoys going to the theatre as much as we enjoy hitting the trails. Thankfully because of the many wonderful Adirondack seasonal theatre companies we never have too far to travel to get our summer theatre fix. There is no need to drive to the ends of the Park in the other months thanks to Pendragon Theatre in Saranac Lake. As the Adirondack’s only year-round professional theatre, Pendragon has been bringing live theatre to the Adirondacks for over 30 years. This year Pendragon Theatre has chosen the theme of “Saints and Sinners” for the upcoming 2013 season. Pendragon’s new Executive/Artist Director Karen Lordi-Kirkham says, “This is the first season that I’ve chosen the plays. The theme began with the fact that A Street Car Named Desire was the first play Pendragon produced. I wanted this to be a tribute to Bob and Susan. Everything else came together and followed the Saints and Sinners theme.” » Continue Reading. 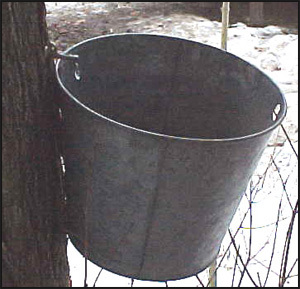 There are a variety of places that a person can visit to see maple sap collected, especially this weekend (March 23-24) as maple producers join together for the second of two New York State Maple Producers Association Maple Weekends. According to New York State Maple Producers Association President Dwayne Hill, the organization has grown to 575 members and helps to educate the public about the production of maple products. Hill stresses the importance of increasing the number of maple producers in New York State. He sees the world dependence on maple products rising, which he believes is partially due to maple being a natural sweetener. » Continue Reading. Getting ready to go green takes on a new meaning as Indian Lake celebrates St Patrick’s Day with a weekend full of activities. With doggie struts and hat parades, there is a wide range of events to make celebrating St. Patrick’s Day a weekend to remember. 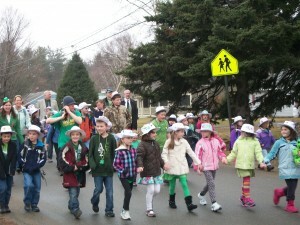 Liddle is quick to say that the parade is open to anyone with a hat and not everyone follows the PARP theme. It is really about getting people outside and having fun. » Continue Reading. 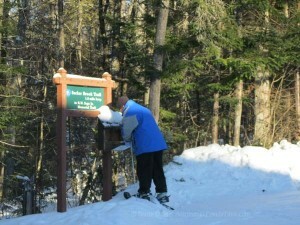 There is still plenty of snow left around the Adirondacks and plenty of places taking full advantage of it. 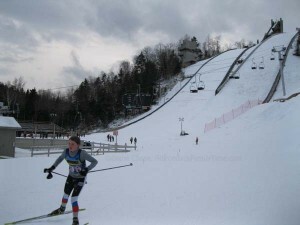 For one, the New York Ski Education Foundation (NYSEF) will be celebrating its annual Kids’ Fest at the Lake Placid Olympic Ski Jumping Complex March 16-17. This two-day event will allow participants a glimpse into the world of Biathlon, Nordic Combined and Ski Jumping. If your child is interested in skate skiing, paintball and biathlon, this venue is a great place to be able to view the action. He/she can even participate for a $40 entry fee, though it is free to watch. Keep in mind that all the other Olympic activities such as riding the chair lift, tubing or going up the chairlift or visiting the observation tower requires admission. Registration will begin each day at 8:30 am with the individual skate races starting at 9:30 am. After lunch on Saturday the Ski Jumping segment begins with the day finishing with the Skate Sprint competition. After the awards at the Olympic Ski Jump Base Lodge, there will be an ice cream social. Sunday will hold the season’s final Adirondack Paintball Biathlon. Science on Sundays at VIEW in Old Forge is continuing March 3 with “Migration of Monarch butterflies in and beyond New York” with Ernest Williams, co-author of The Stokes Butterfly Book, author of The Nature Handbook: A Guide to Observing the Great Outdoors, as well as other books, journals and numerous articles. Recently quoted in New Scientist magazine regarding the monarch butterfly migration, the Hamilton College Biology Professor stated that the Monarch butterfly species is not threatened, but rather its migration is endangered. 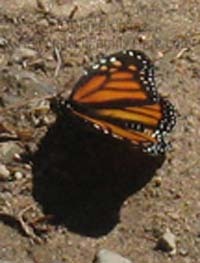 Williams further states that if the climate alters, there are possibilities to consider such as a migratory shift further into Canada during summer or the monarchs may stop before reaching Mexico in the winter. » Continue Reading. 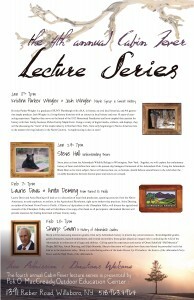 Though our family always enjoys the numerous Adirondack trails, we also like to experience rich history through lectures available at a variety of wonderful venues. Not only are these lectures led by experts, it is an inexpensive way to entertain a crowd as well as a delightful way to learn more about a wide range of topics. Those of us with young people can take advantage of the benevolence of the speaker or performer. Most people graciously answer questions or enjoy showing people of all ages the tricks of their trade. Whether it’s a fabulous round of storytelling by Chris Shaw or an historical retelling from Heaven Up-h’isted-ness!’s Sharp Swan, here is just a sampling of places to go and lectures to hear. » Continue Reading. Valentine’s Day may just be the time to have a small town film experience with old-fashioned appeal. The Strand Theatre in Old Forge offers a heady dose of nostalgia, not only with its beautiful Art Deco setting, but also with an eclectic collection of movie memorabilia. With four screens and seating of 708, the year-round Strand Theatre at Old Forge continues to bring new movies to the screen. Make sure to leave time to explore before choosing your seats. For us, seeing a film isn’t what brought us inside the theatre doors, it was a window display of film reels and camera parts. 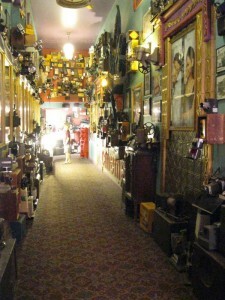 After meeting co-owners Bob Card and Helen Zyma, my children and I were pleasantly surprised to turn the corner to find a mini-museum dedicated to film. » Continue Reading. February may have fewer days than any other month, but Lake George has made sure to pack it with as many activities as possible. 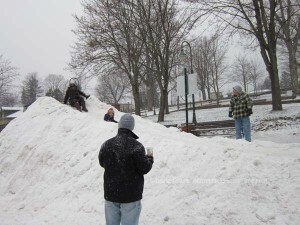 This weekend kicks off the second weekend of a month-long celebration of winter at the Lake George Winter Carnival. According to Lake George Winter Carnival Committee Volunteer Brenda Travis this is the 52nd year of the Carnival. She remembers coming to Lake George as a teen and looking forward to all the Winter Carnival events. “Now I am helping to organize the activities,” says Travis. “The Carnival is so much fun and has so much going on. 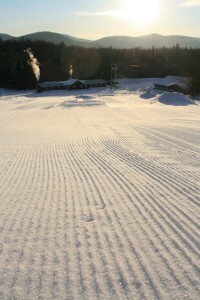 This weekend will be the Northeast Snow X series Carnival Cup. This is a new event. It is a snowmobile race with professionals going around a track and jumping moguls. Sometimes they can get up to 12 ft. in the air.” » Continue Reading. Recently acquired by the Monette family of Malone, Titus Mountain Family Ski Center has undergone a facelift that our family has met with welcoming arms. 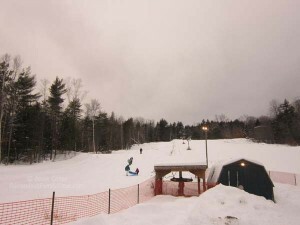 My kids have skied at most of the Adirondack and beyond ski mountains and have found Titus Mountain to be a perfect place to experience family-friendly trails and gain some ski lift independence. The elevation is 2025-ft and the crumpled trail map I find in my ski jacket shows that Titus Mountain has six double chairlifts, two triple chairlifts, and two hand-tows serving 42 trails and two terrain parks. » Continue Reading. 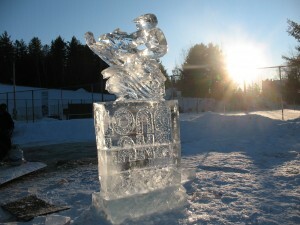 Ice Sculptor Stan Kolonko will be in Long Lake for the second year as part of the Long Lake/Raquette Lake Ice Fest January 11-12 and bringing a special brand of art to area businesses. According to Long Lake Director of Parks, Recreation and Tourism Alexandra Roalsvig, Stan Kolonko is providing just one part to the many activities over the course of the two-day event. » Continue Reading. We recently spent our New Year’s Eve with family and went exploring the Schroon Lake region of the Adirondack Park. 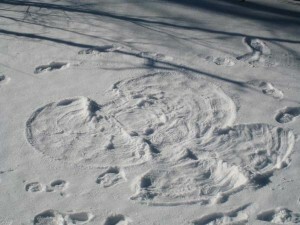 The snow is here and my Adirondack family is going to enjoy every minute of it. My mother shares stories of my father’s early military career, which at some point involves a campground in Schroon Lake. Of course that means packing up the car and taking a ride along Route 9. We ask at a local restaurant for campgrounds and are given the names of Scaroon Manor and Eagle Point. Though the road trip is inspired by my mother’s stories, we also want to find some fun trails to snowshoe or a pond to skate upon. 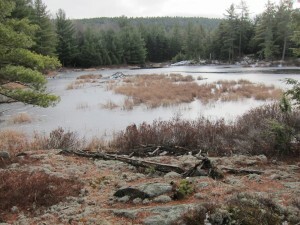 We are surprised to find that most of Schroon Lake’s water in unfrozen. This rules out any lake ice-skating and we are not prepared to downhill ski at Gore. Continuing on Route 9 we pass a sign announcing that the free Schroon Lake skiing and sledding hill is open. » Continue Reading. Like most people living and visiting the Adirondacks, my family has been waiting for the snow to stay. Ski resorts all over the Adirondack Park are celebrating this most recent storm, cushioning their base layer with natural snow. Our family enjoys skiing on a variety of terrain, but there is something wonderful about returning to those family hills where many of us were first introduced to the excitement of downhill skiing. 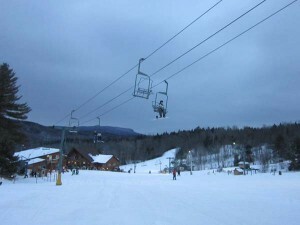 One such family mountain is Speculator’s Oak Mountain Ski Center. Now under new ownership, the O’Brien family has filled the Oak Mountain schedule with all sorts of exciting family-friendly events. According to Laura O’Brien, owner and VP of Sales and Marketing, Oak Mountain has just been enhanced and is still the same family ski resort where many visitors and locals have grown up skiing. » Continue Reading. I was going to write about ski centers and getting ready for Christmas, but this morning my nine-year-old didn’t want to go to school. She sat on the floor with her lunch box in her hand and started to cry. When I asked her what was wrong, she described a story she heard at school, about children escaping from Sandy Hook Elementary. I know I am not the only parent that is struggling with a conversation to explain the unexplainable to our children. Sadly, my children are not strangers to death. They were given a dose of reality when they lost their eight-year-old cousin to cancer and both grandfathers in the course of a year. My daughter questions why some people die while others live. I am not able to provide her with answers. Thankfully she does not yet seem obsessed with her safety. She plays with her friends and wanders the woods around our house, but obviously somewhere buried deep the stories matter.